Check out all our unique giving opportunities. The animals thank you! There are several naming opportunities for Kitty Corner in San Anselmo, as well as the Marin Humane park areas and the Dog Adoption Center in Novato. We’d love to meet with you and show you the available areas. Please call Joe Lisella, our director of development, at 415.506.6257 if you have any questions or to arrange a site visit. 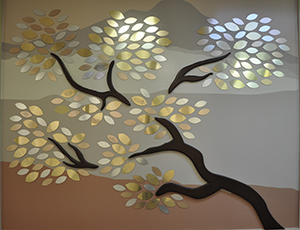 Support Marin Humane while honoring or remembering a favorite friend with a leaf on our Giving Trees (pictured right) located in the Cat and Dog Adoption Centers. These beautifully engraved leaves (starting at $250 each) also make a thoughtful gift! To order, contact us or call us 415.506.5259 or 415.506.6231. Call 415.506.6231 to learn more. We’re grateful for the many generous foundations who partner with us to bring about a more humane world for every animal. Call 415.506.6233 to learn more about how your foundation can support in our life-changing programs. Your used car is their ride home! Are you thinking of selling or trading in your old car? Why not donate your vehicle to Marin Humane? Your charitable donation can make lives happy for the animals at our shelter. To donate your car, please visit All Bay Vehicle Donations or call 877.700.4483 or 925.427.4483. Visit smile.amazon.com, select Marin Humane as your charity, and shop away! When you go back to Amazon in the future, be sure to save smile.amazon.com to your favorites and Marin Humane will receive a donation based on the amount of your total purchase. Through their Shop & Give program, Mill Valley Market donates 2% of your total receipt to Marin Humane! All items for purchase qualify, including wine. Simply tell the checker at the beginning of your transaction that you’d like the contribution to go to Marin Humane. Your Nugget Community Card also supports Marin Humane (be sure to specify when registering).